Christmas season. 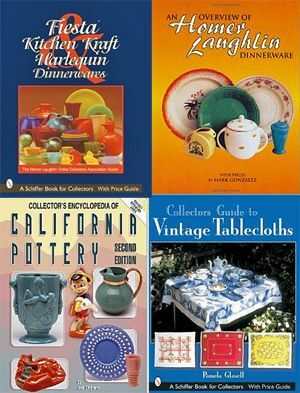 Stop over at Happy To Design to visit some other favorites from the past. 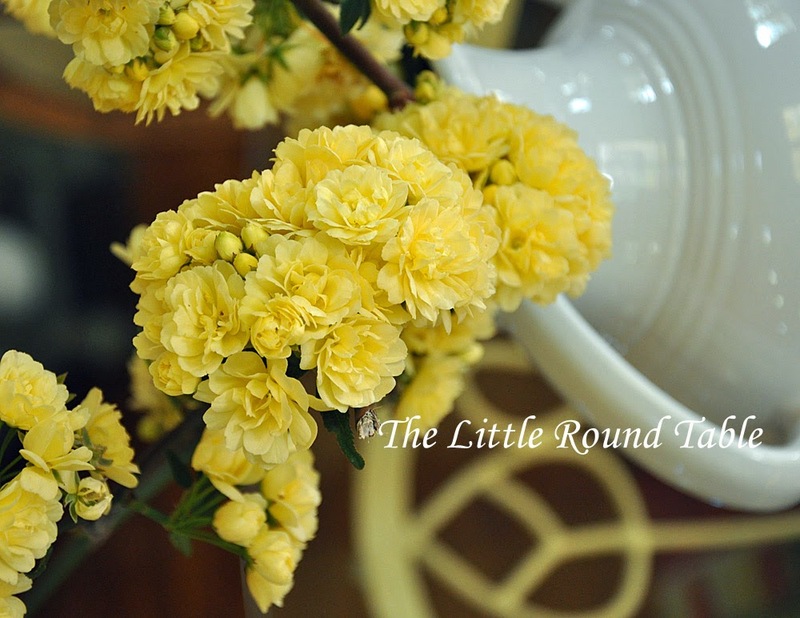 stop by and see all the bloggers' views of this season. Santa is checking his list for boys and girls who have been especially good this year. I'm checking my list to see if you are reading this post carefully too! 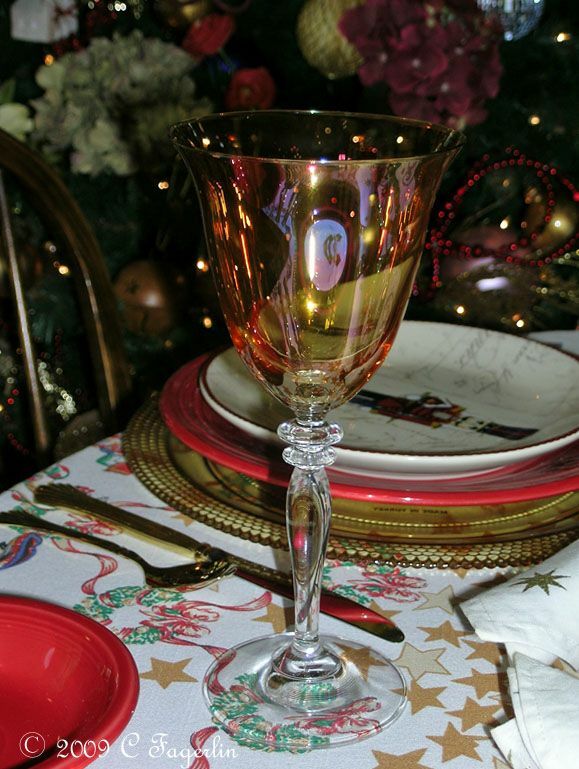 I will be announcing a giveaway of a "Nutcracker" tablecloth in the near future. 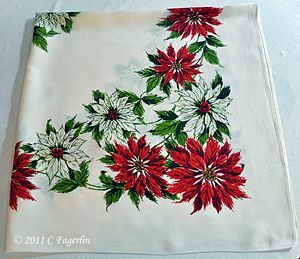 Would you like to win this tablecloth for your holiday table? 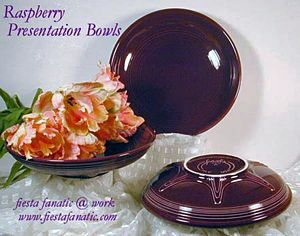 if you'd like to be among the first to be entered in the drawing. You need to be a follower on my sidebar to be eligible! 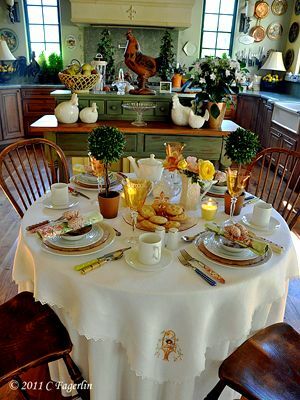 Beautiful table. 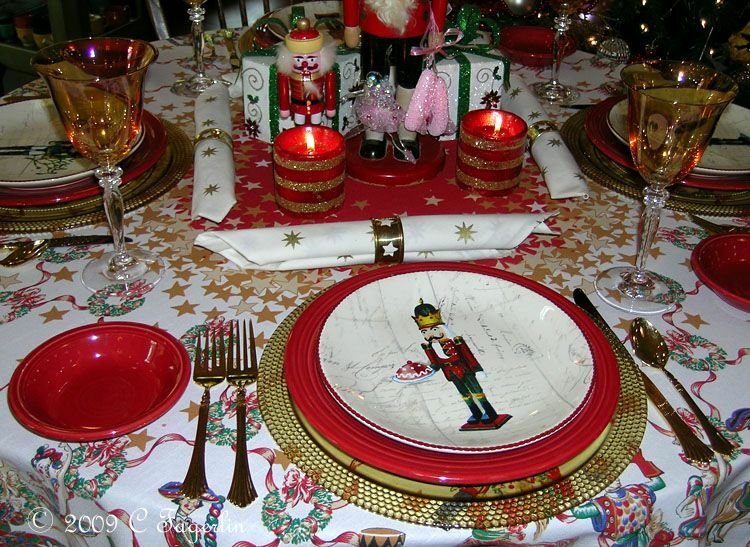 Love the tablecloth and the tall nutcracker. Oh, I can't wait until Christmas. 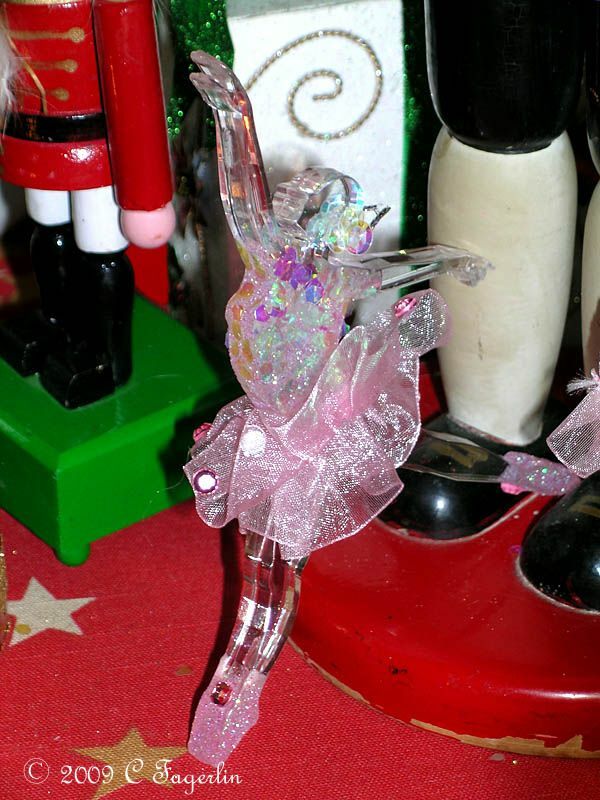 Now I'm humming the Dance of the Sugar Plum Fairies tune! Hehe! Well my dear lady, what a beautiful Christmas post! Ohh...I wished that you could have heard all of my ooohs and aaahs when I seen your fabulous tree! It's truly magnificent! I could just sit for hours and checking out all of the pretties on that tree! 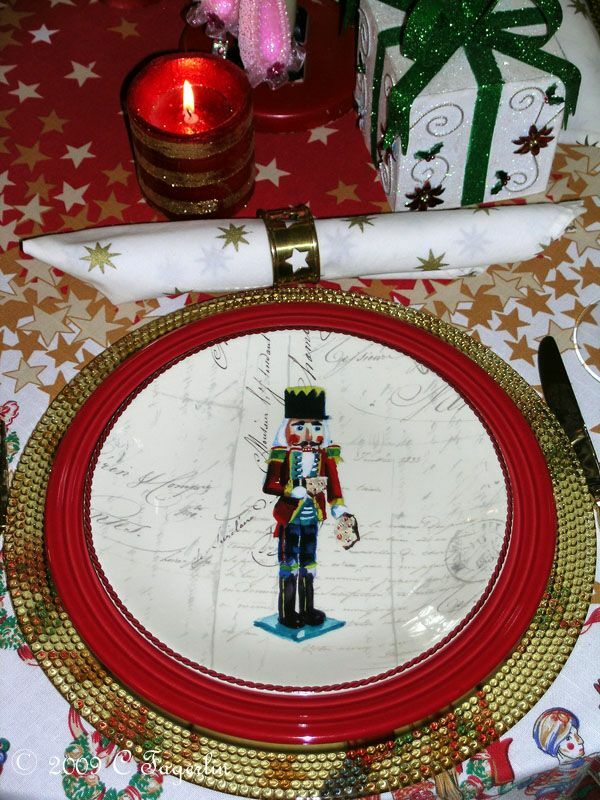 And...your Nutcracker tablescape is awesome! 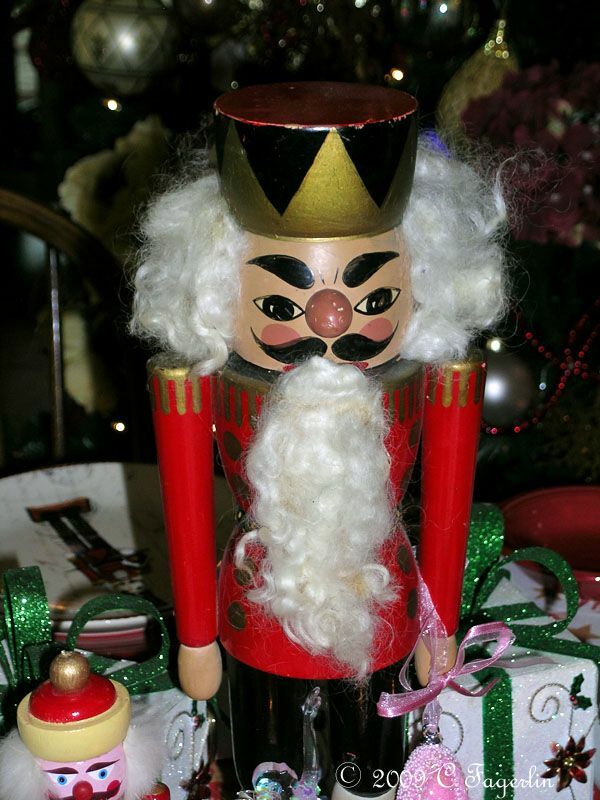 I started collecting nutcrackers a few years ago...I don't have many but there is just something about them! 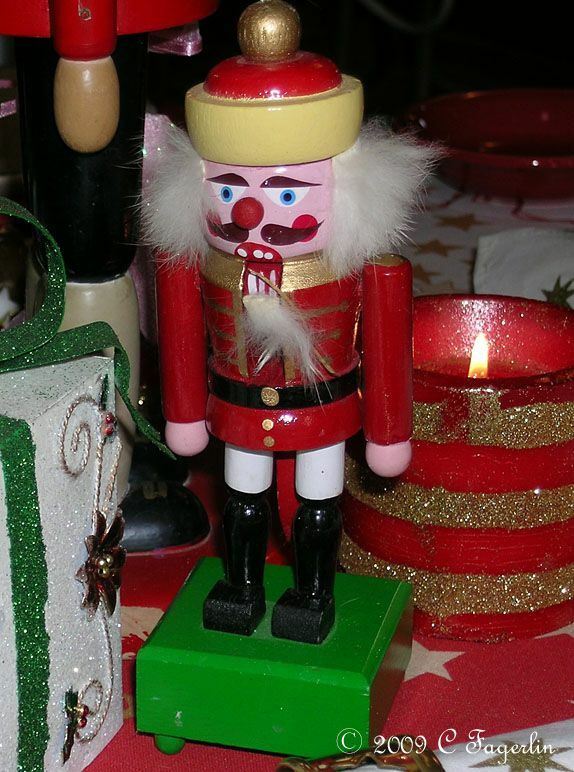 When I was in Europe four years ago, I decided to at least pick up a nutcracker from each country that we traveled to. 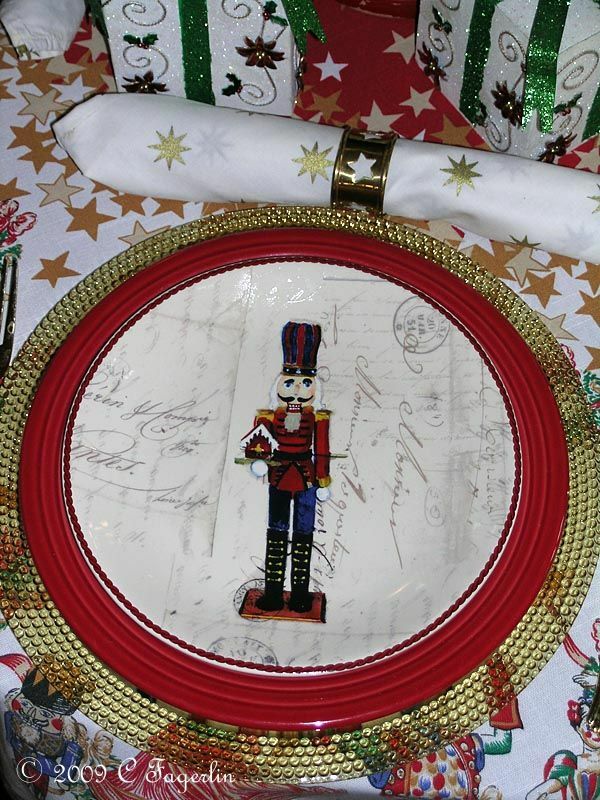 I just adore those pretty nutcracker plates...oooh! 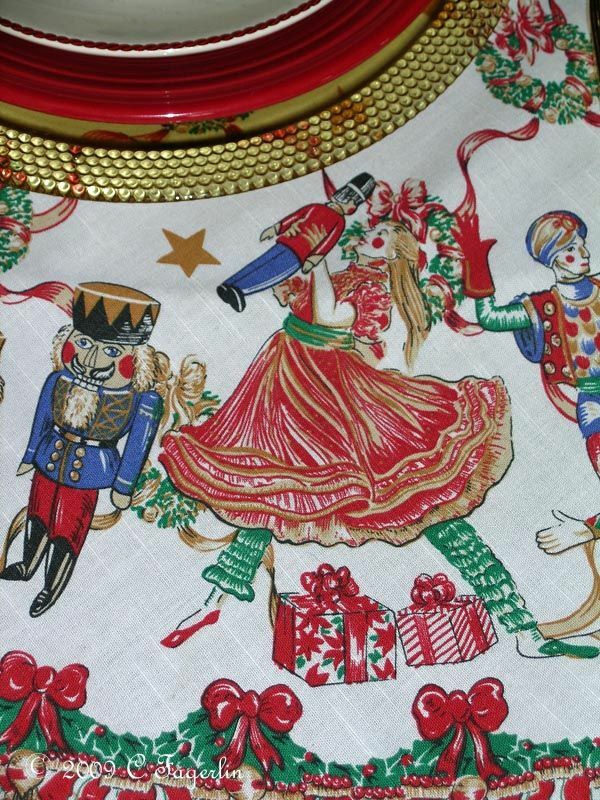 Ohh my...and the nutcracker tablecloth is fabulous!!! I love it! 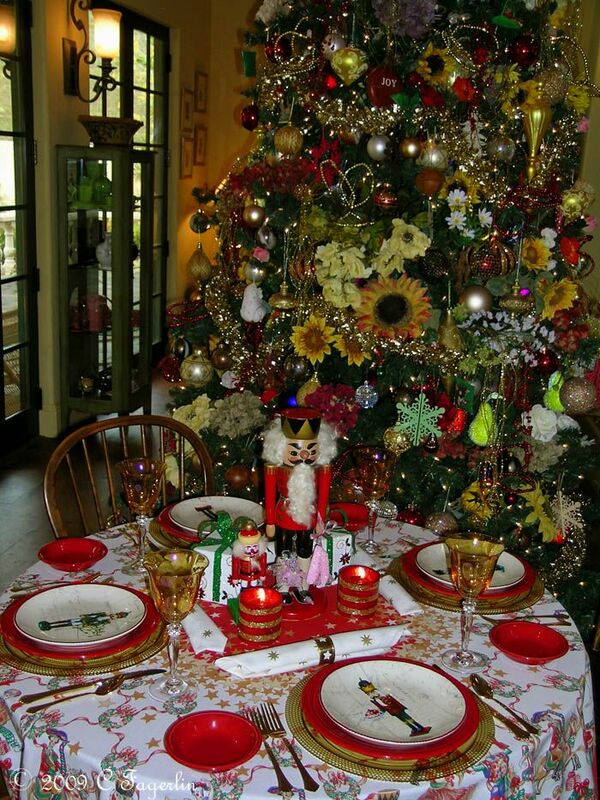 Thank you so much for sharing your fabulous Christmas tree and table with us for Sunday Favorites this week!!! It won't be long till Christmas! I love your plates ! 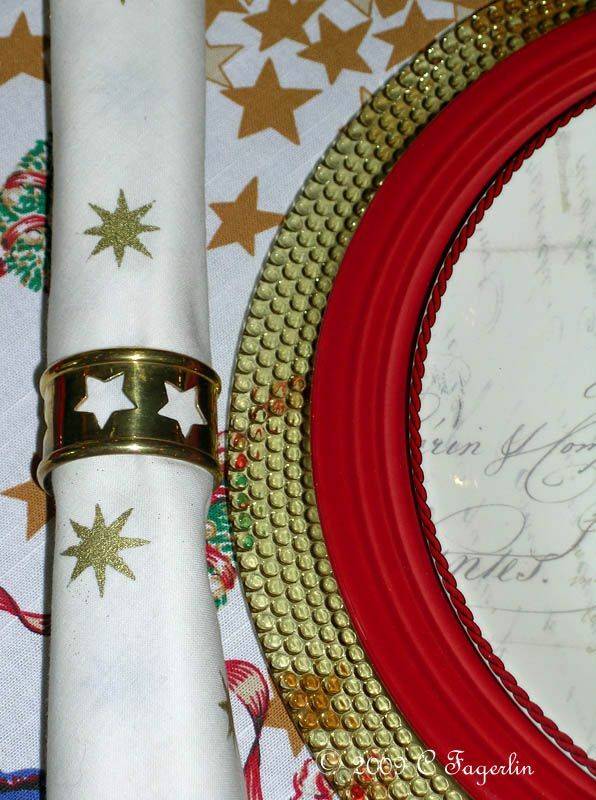 this is a perfect xmas tablescape ! I didn't know the plates with nutcrackers existed..Here in France i found some xmas tree ornaments in the shape of wooden nutcrakers, lovely ! i'm going to use them in a xmas tablescaping theme ! 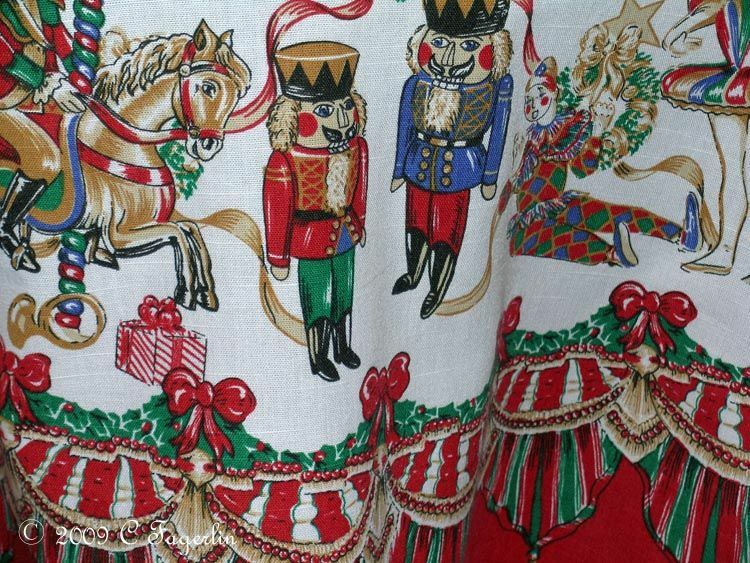 Candy, I'm thinking the Nutcracker tablecloth giveaway was LAST December? But...just in case...I'd LOVE to win it!! Well it was really unclear that this is a SOON TO BE ANNOUNCED giveaway because of the way I positioned the text! And why am I up at this O'Dark thirty hour you ask? Well the power has been out and just came back on .... TV blasting, smoke detectors re-setting themselves, the ice maker making some horrible whirring noise, printers re-setting themselves, cat howling to get out away from all the noise! 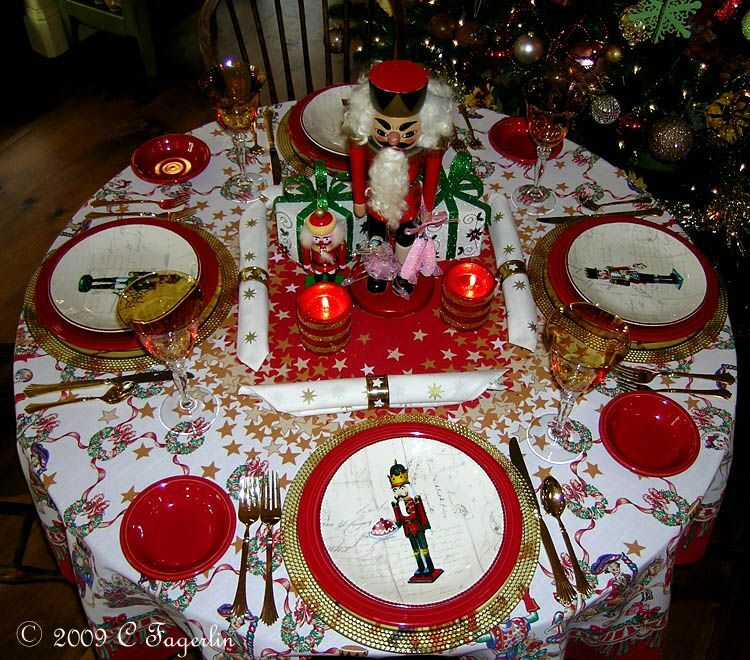 This table is fantastic...you're spreading the Christmas spirit by sharing your awesome tables from last year. 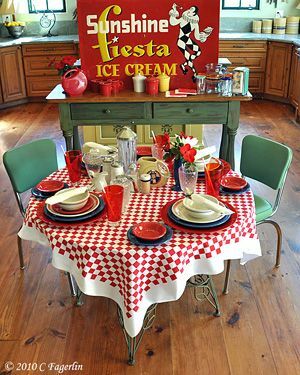 I'd love to be in the drawing for the tablecloth. Thank you! 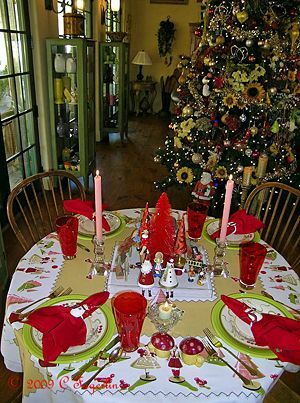 Your table is just darling, but I couldn't take my eyes off the tree in the background -- so gorgeous! 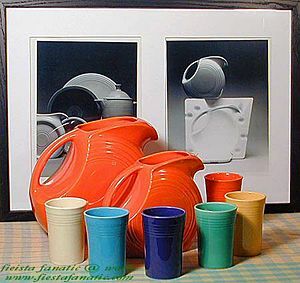 I, too, love FiestaWare but only have the new pieces. This is a fantastic table. I love all of the detail. The cloth itself is exceptional! 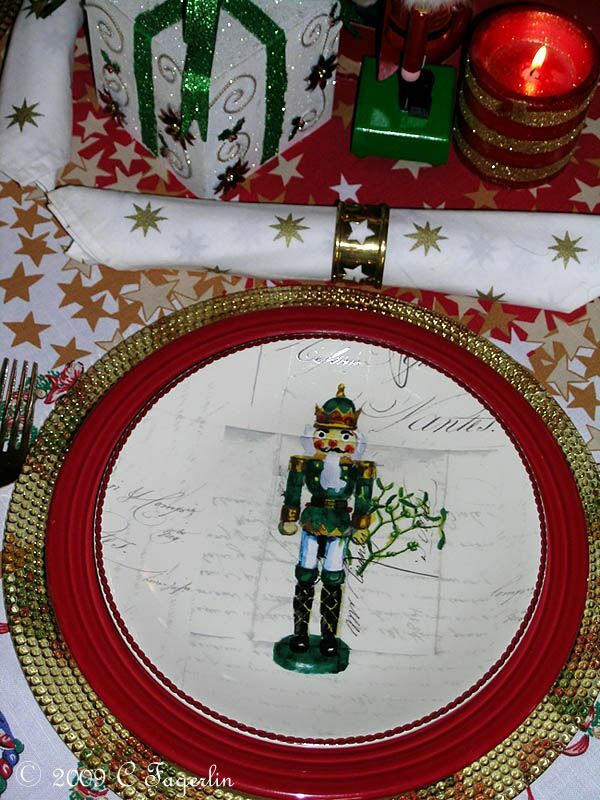 Your nutcracker table is absolutely gorgeous!! 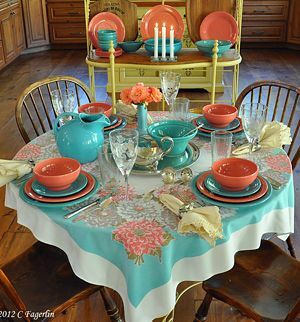 Beautiful table! I love how everything is tied together perfectly. What a abeautful table and tree!! Gorgeous!! 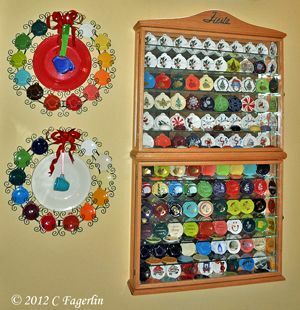 You know, every time I click over to visit you, I think of "candy" when I see your banner full of colorful dishes! 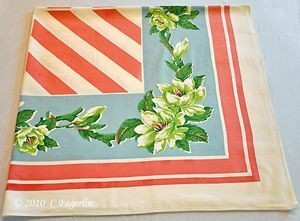 I adore tablecloths and would of course love to win this one. 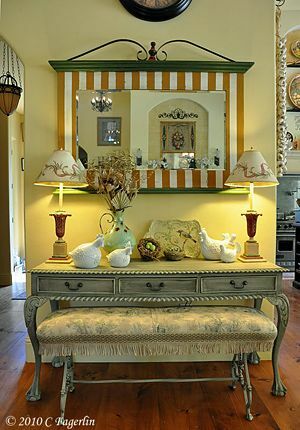 Your table is a work of magical art! Oh, forgot to ask. 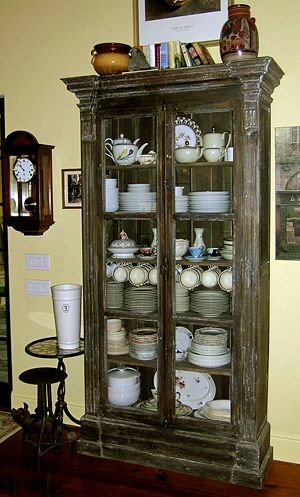 Where did you get the red and white checked flatware that is in your revolving sidebar photos? What a beautiful table. And the glimpse of your tree is glorious! 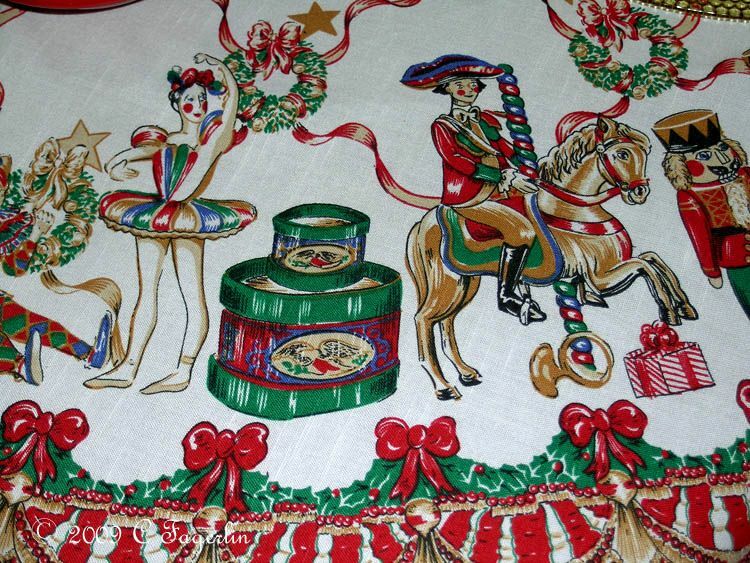 Thanks everyone, the Nutcracker tablecloth is just itching to go to it's new home. 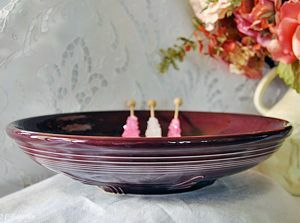 I think I'll be posting the give-away for the first of the holiday tables to be posted on Wed Dec 1st with the give-away ending with the following Tuesday's tablescape. So stay tuned and your names are all in the bucket! 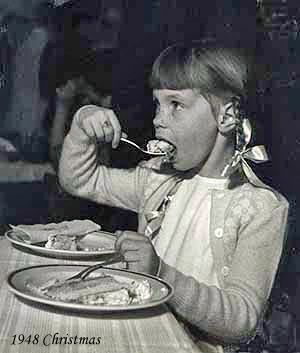 Brenda - The flatware is by Cambridge and is called Red Dots or Red Dots Gingham. I found it online through Google. Nutcrackers have always been my favorites. I love yours. 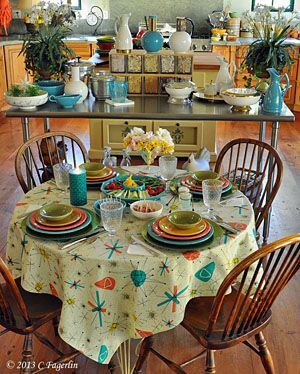 The tablecloth is absolutely my favorite. Your table is a delight!! Nice to see you again, your hat is also in the ring, so watch for the "official" post on this giveaway. 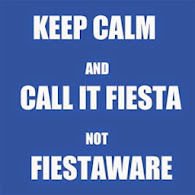 OMG, this is WONDERFUL!!! 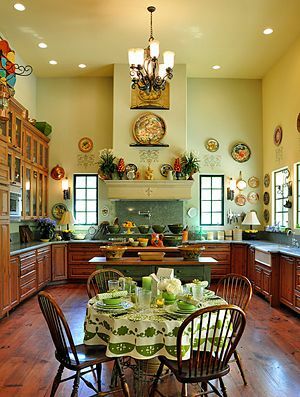 I LOVE,LOVE,LOVE the dishes, they are not too busy, JUST PERFECT with the cloth!!! Everything "AS ALWAYS" is Perfect! I used it yesterday after all, but no photo op this year. 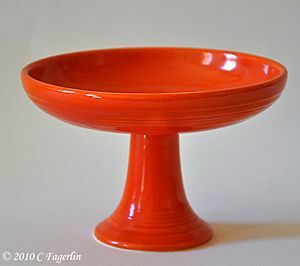 Hoping it will make a comeback for next season's holiday tablescapes.